Access to Oma. All travel times are estimates. 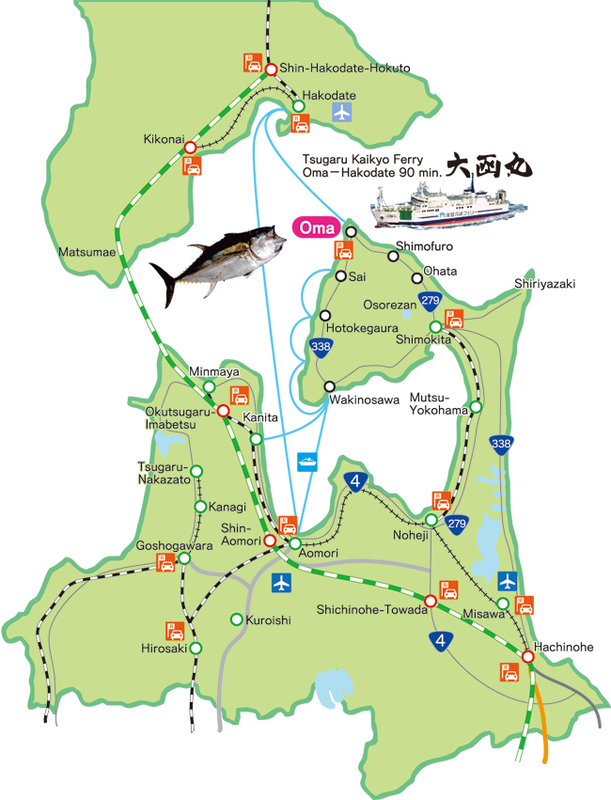 For more details, please visit the Tsugaru Kaikyo Ferry website. ◆For more information about rental cars, please visit the Orix Rent-A-Car website. ◆For more information about the Tohoku Shinkansen and the Ominato Line (Noheji Station to Shimokita Station), please visit the JR East website. ◆For more information about the Aoimori Line (Aomori Station to Noheji Station), please visit the Aoimori Railway website. ◆For more information about the bus system (Shimokita Station to Oma, etc. ), please visit the Shimokita Kotsu website (Japanese only). *Take the Sai Line from Mutsu (佐井線・下り), headed toward Oma. ◆For more information about the Aoimori Line (Hachinohe Station to Noheji Station), please visit the Aoimori Railway website.